"How a handful of scientists obscured the truth on issues from tobacco smoke to global warming." This documentary directed by Robert Kenner takes a critical look at the phenomenon of privately retained consultants hired to explain complicated scientific issues in the media to the public. It focuses on widely debated topics implicated in climate changes and the environmental impacts of chemical products. The film raises the possibility that some controversies may inspire public debate influenced by commercial interests, not factual data. Authorities appearing in segments of this comprehensive, well researched film include: Bill O'Keefe, James Hansen, Marc Morano, Stanton A. Glantz, Patricia Callahan, Michael Mann, Matthew Crawford, Tim Phillips, Naomi Oreskes, Sam Roe, and John Passacantando . 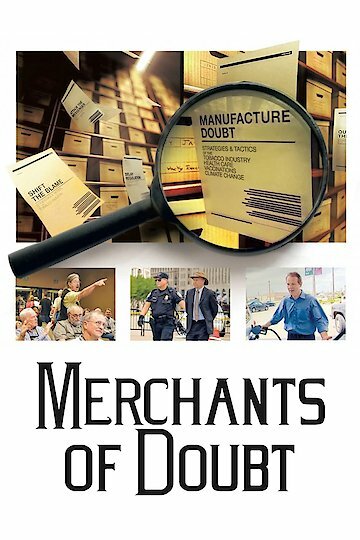 Merchants of Doubt is currently available to watch and stream, buy, rent on demand at FlixFling VOD, Amazon, Vudu, iTunes online.